On these hot summer days I would like to tell you another herbal story. This time it’s about the queen of flowers; the rose. Who doesn’t like stop to smell the roses? At least, I try to do so, but the sad thing is that there aren’t many gardens with roses anymore. Happily my mother loves roses very much and has a garden filled with many varieties of roses. 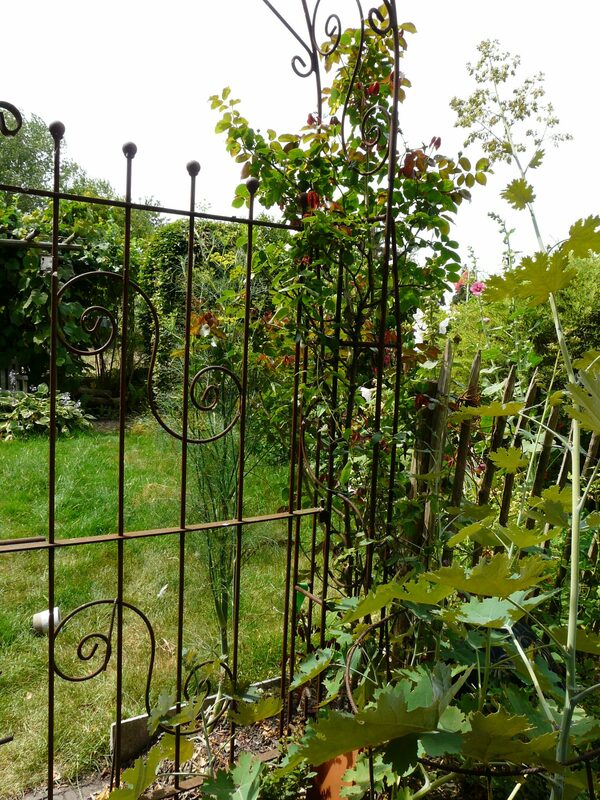 Against this wrought iron gate in her garden grows one of her many pretty roses. 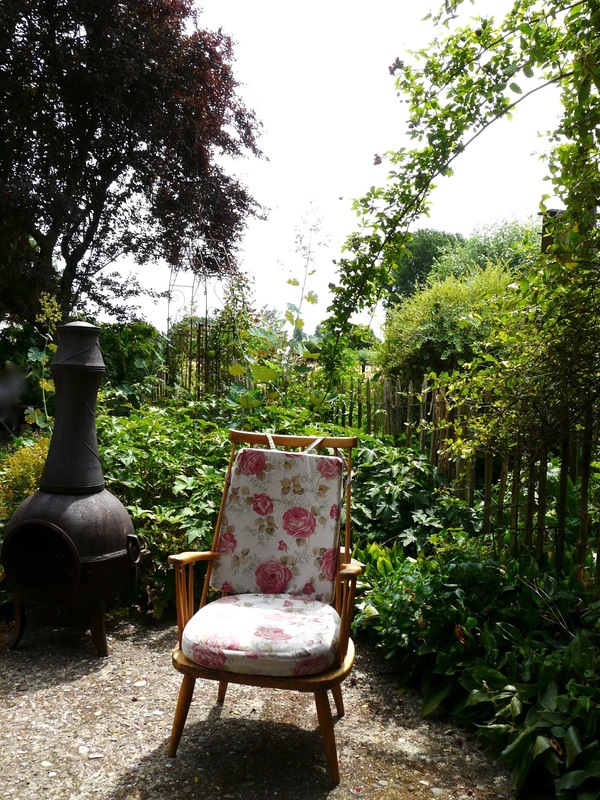 A cosy corner in my mother’s garden, sitting beside fragranced climbing roses. A perfect place to enjoy their overwhelming scent! 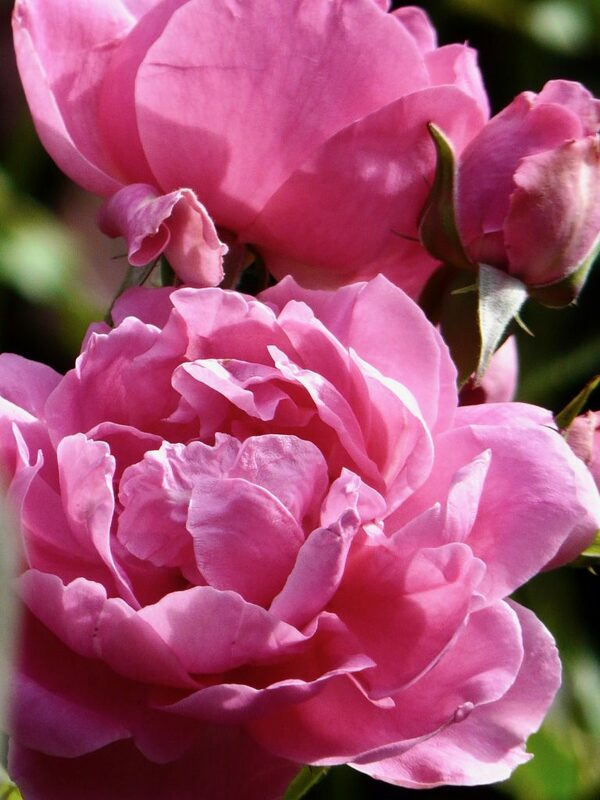 Aromatic roses have the power to melt away our stress and tension and immediately uplift our moods. Their scent can take us away from our daily worries to another world for a little moment. And that’s what we need from time to time don’t you think? The rose, a symbol for love and romance, is useful for so much more than just looking pretty. Rose has a profoundly positive effect on the emotions. It stimulates the production of dopamine, the “happy hormone”, and strengthens the parasympathetic nervous system, instilling a relaxed feeling of well-being. 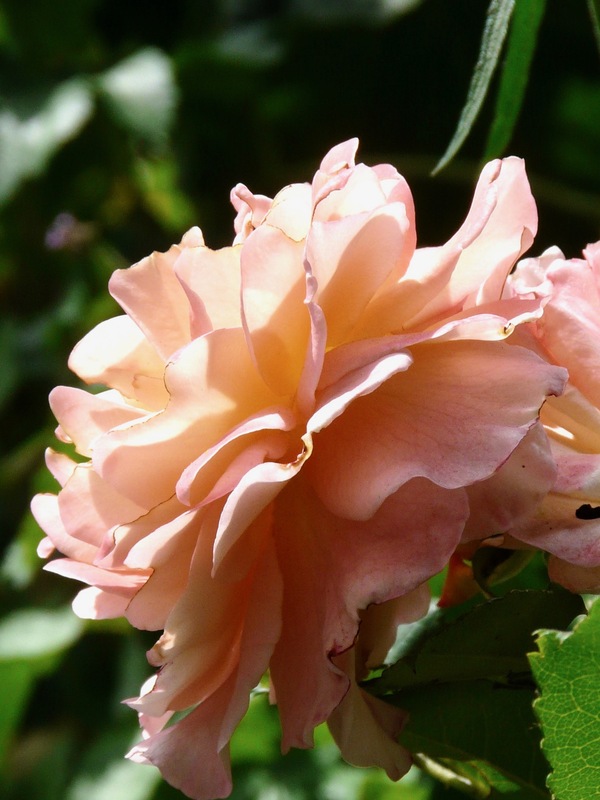 In this way, rose oil is beneficial for treating anxiety and depression. It works calming and harmonizing on our emotions. 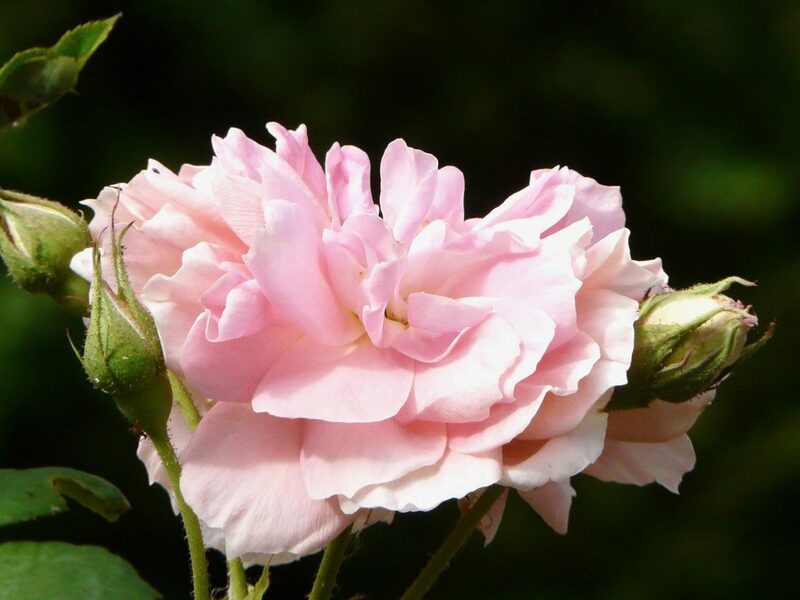 Traditionally, rose oil has been considered as a female oil. It’s no wonder it has a remarkable positive effect on the female organs. The oil regulates the monthly period and the emotional complaints that goes along with it. 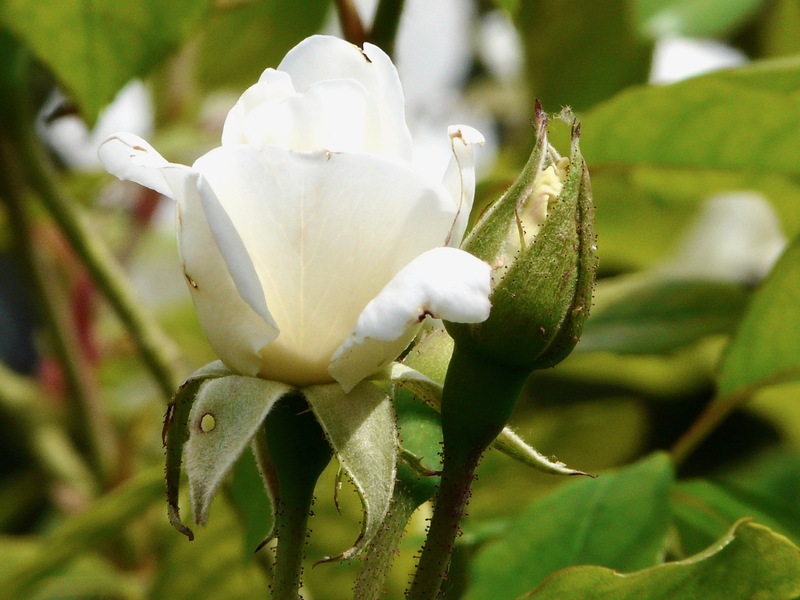 Rose oil can be used for treating light burn wounds, inflamed and sensitive skin. If you have been burned, add 1-2 drops of rose oil to a table spoon of almond oil and salve the wounds with this mixture. Adding 2 drops of rose oil and 1 drop of lavender oil in a vaporiser or aroma lamp in the bedroom will make sure you’ll have a good night rest. Or just make your own perfume by adding 1 drop of rose oil to 5 ml jojoba- or almond oil and you’ll have a perfume that will last long and scents heavenly. I use rose floral water as a face tonic every evening. Rose water perk up the skin and soothe the mind with its subtle scents. It has an astringent and soothing effect. It regenerates the cells, it stimulates your skin and increases the blood circulation. It works as an humidifier and vitalises the dry, older and sensitive skin. Rose water works anti-flammatory and antibacterial. It strengthens the pores, balances and restores the Ph of the skin. Rose water can even be used for making marzipan and gives a delicious flavor to desserts. Or add a little to your homemade lemonade. A compress made of a cotton pad drenched in rose water will soothe tired and sore eyes. Leave the compress for at least 15 minutes on closed eyes. What delight to be fairy of the Rose! 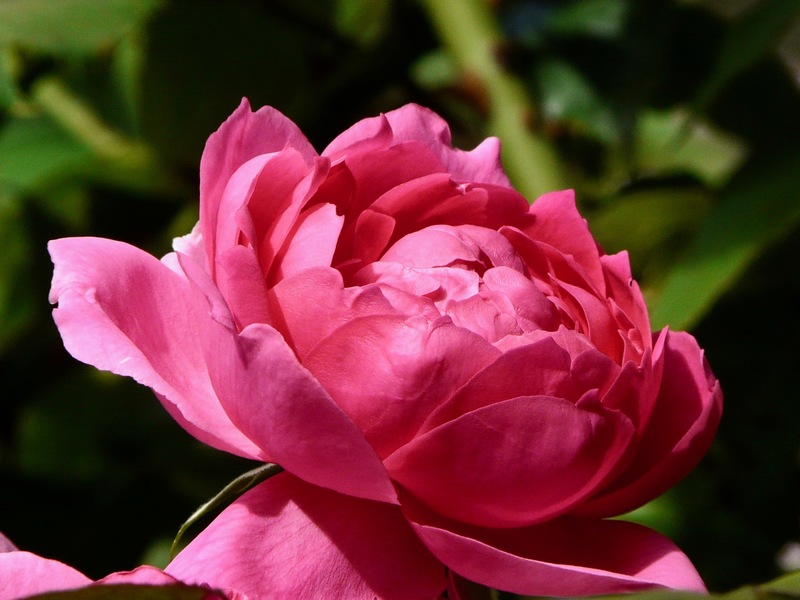 Rose essential oil is the queen of the essential oils with its exquisite floral fragrance. One needs 5000 kilo rose petals to produce 1 l of essential oil. That explains why rose essential oil is one the most expensive oils. 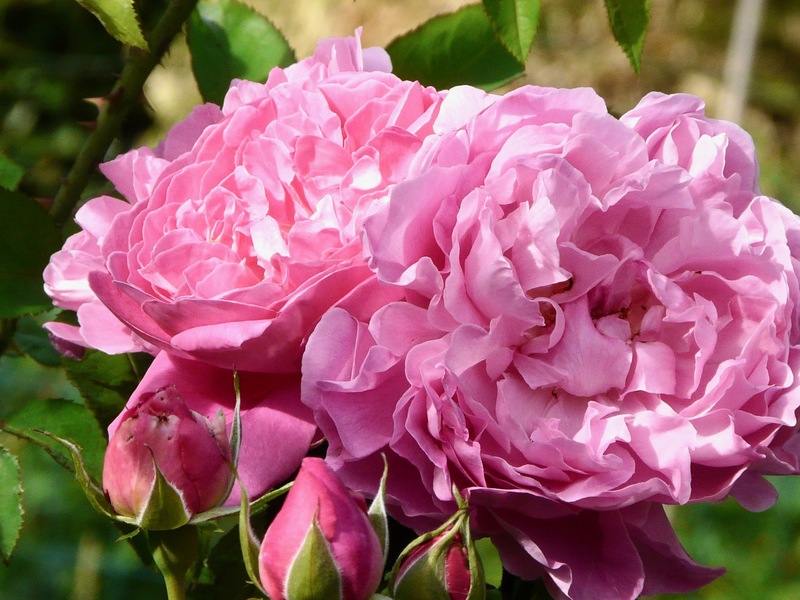 The real rose essential oil is made from the provencal and damask rose through steam distillation. Rose water is the side product of this steam distillation. 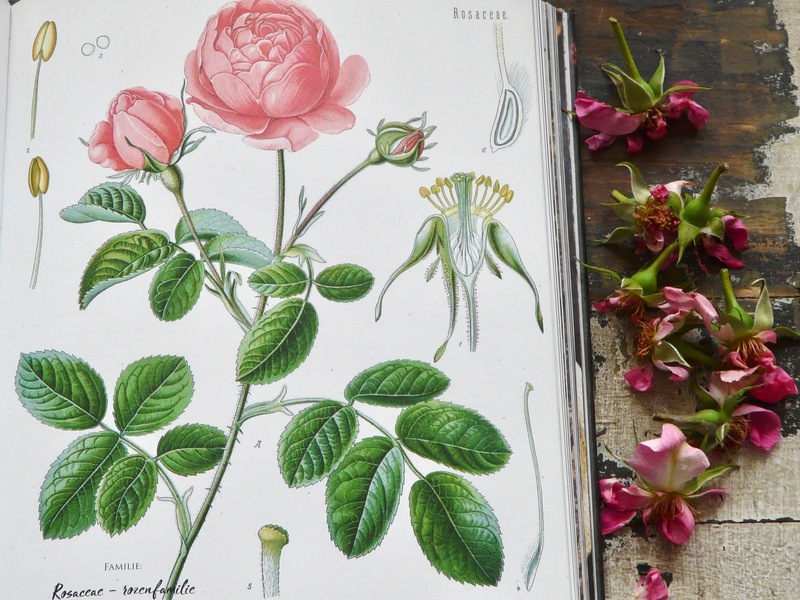 A botanical illustration of the rose (Rosa). There are many types of roses and over 100 species of roses today of which many are renowned for both their beauty and their health benefits. However, home remedies with roses work best when using wild or traditional varieties. This is because modern- day hybrids lack the depth of scent and beneficial compounds of these older varieties, but they will work fine if they are all you have available. In spring we have planted two climbing roses, one of them is the New Dawn. A variety that goes back to 1930. These older species are mostly strong and sick-resistent plants. But they still need special care I have to learn about. I hope to have abundant blooming roses the next years so I can harvest their petals to make our own rose floral water. 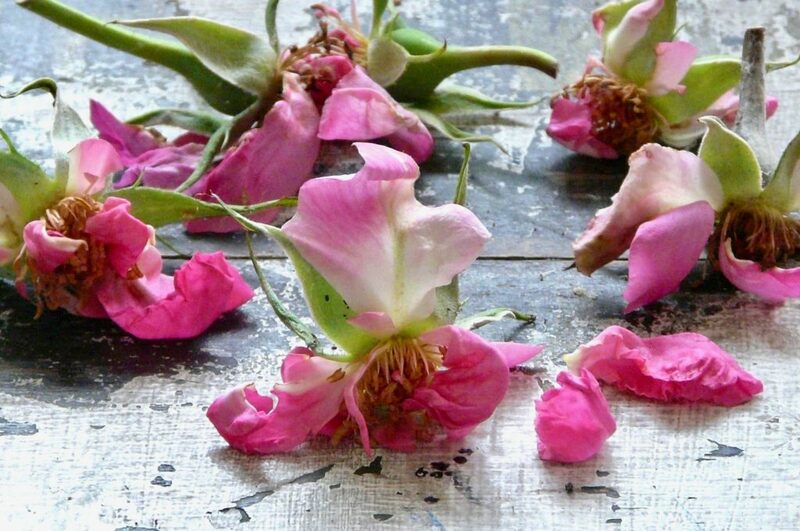 Always harvest rose petals of roses that haven’t been treated with gardening chemicals. 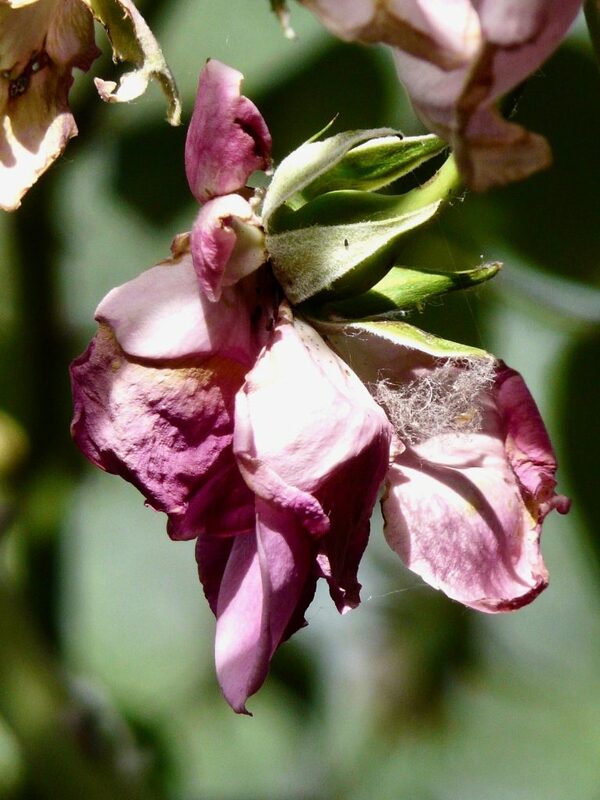 Don’t pick roses that grow along the highway or in polluted areas as they absorb the harmful chemicals. If you can’t harvest or grow them yourself, you can always buy organic petals. 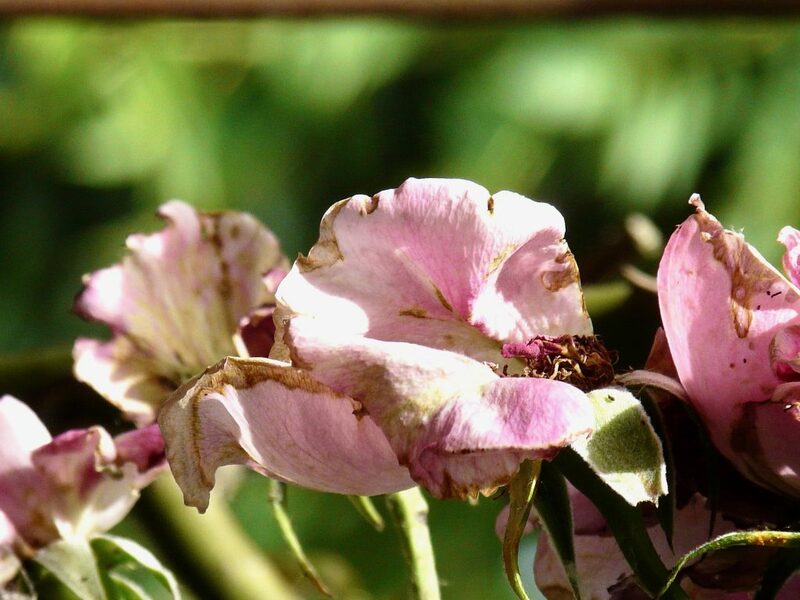 Harvest the petals on a sunny day before midday and when the morning dew has evaporated. Don’t harvest all the petals from one bush but spread your harvest on multiple bushes. 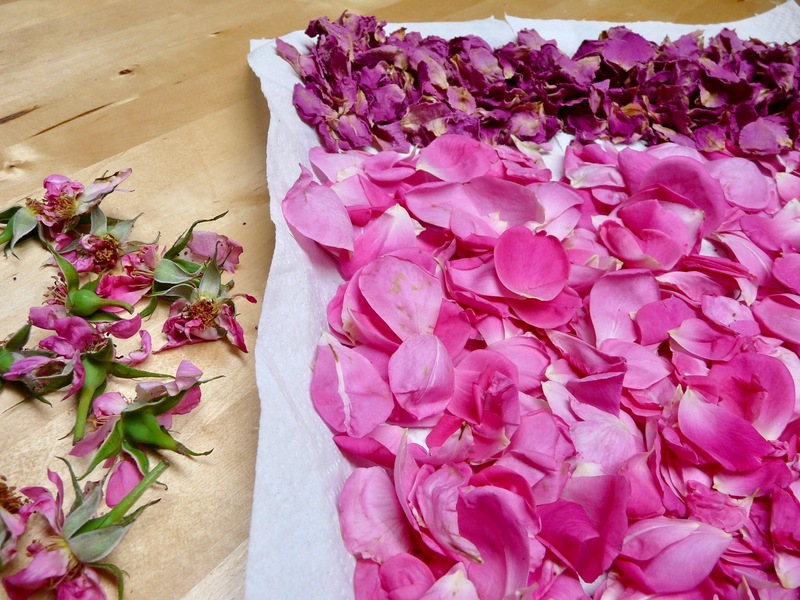 Rose petals from my mothers’ garden ready to dry. I simply dry them on a towel or paper in a dark, ventilated space until they are crispy and break apart. Once they have dried, I store them in paper bags in a cupboard where they are out of reach of direct sunlight. 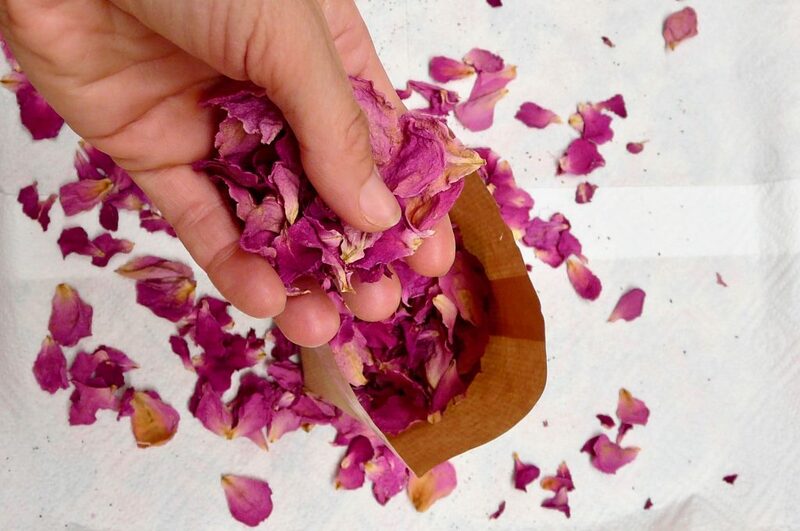 You can make your own potpourri by blending dried rose petals with complementary scents like cinnamon sticks, dried ginger or whole vanilla beans, and put the mixture anywhere you want to freshen up. Use it for example in your linen closets or in the bathroom. 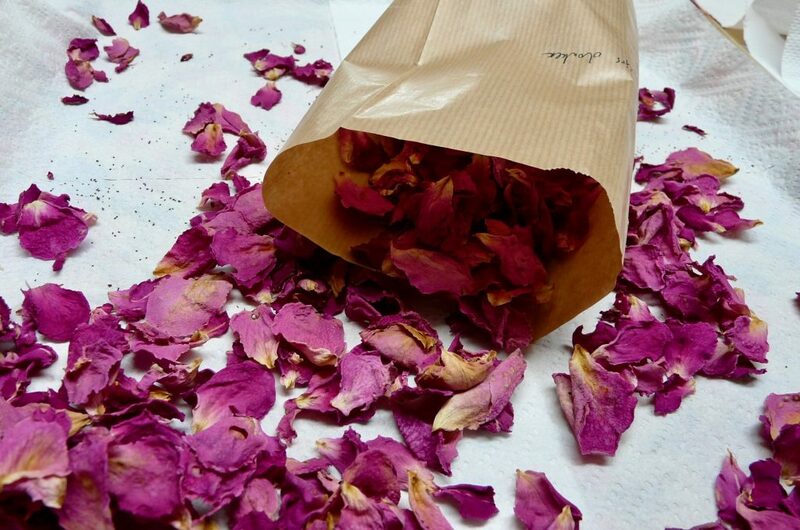 Rose petals can also be used in herbal teas. 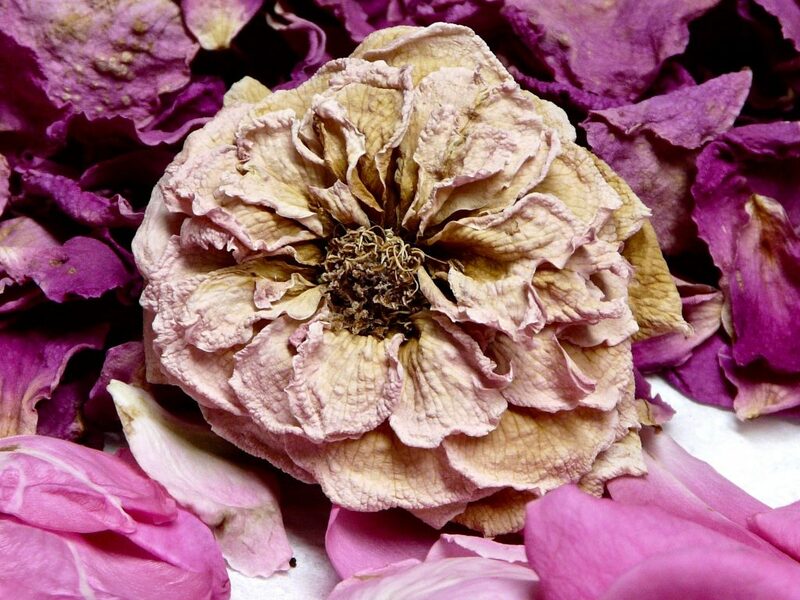 Blend the dried rose petals for example with chamomile blossoms, lavender buds and lemon verbena . And what about sprinkling some rose petals on a homemade chocolate cake?! It will make it look so pretty and add a special flavour. This post is a little tribute to my mom, who has learned me to love roses! For my dear daughter Nausika, your lovely rose-story affected my hart! Yes, roses are my passion because of their beauty, smell, health and different colors. They make my day lovely and sweet when I meet them in my ‘Pardes’ garden. I can talk to them and tell them my joy and sorrows and they listen to me and say nothing but give me their beauty to bright up my days. 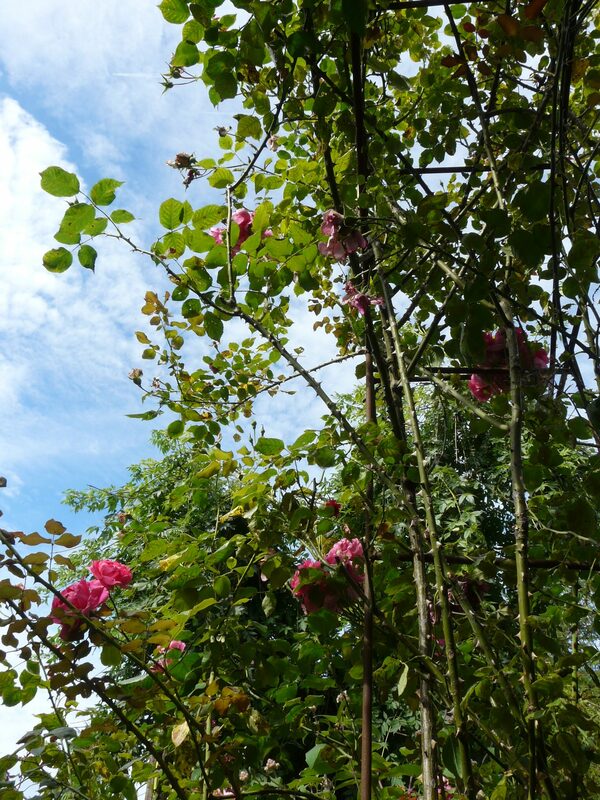 For every child born in the 4 seasons I have one special, yours is Rosa ‘Climbing Etoile de Hollande’! 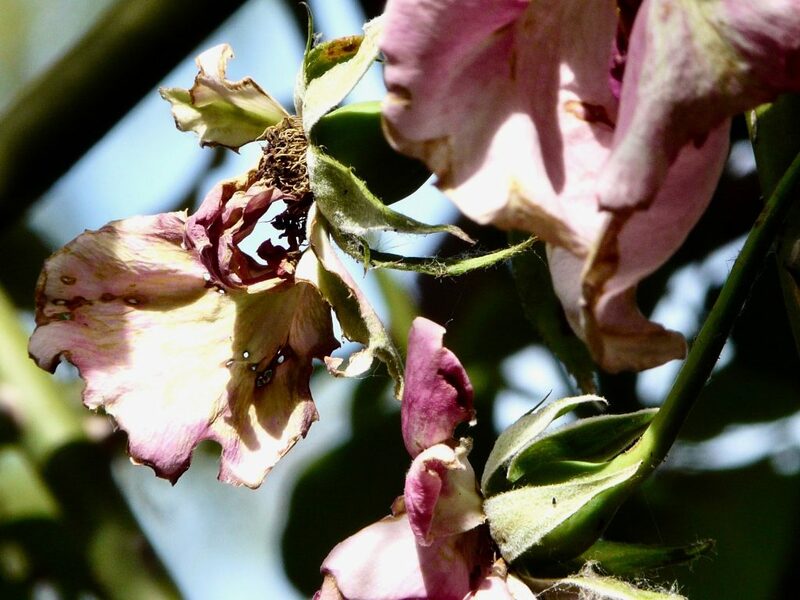 The climbing sport of the famous old Hybrid Tea. Its long buds open out to large, double, crimson-red flowers with a delicious, heavy Old Rose fragrance. It produces a profusion of blooms, both early and late in the season. When I see these I am always thinking of you with my hart. So when children goes their own way, still they are with me in my garden and when the first rose blooms, I send them a picture with my love!